The People Inc. ESS module provides a full range of benefits to both the organisation and the employee. This includes features that enable an individual to view their holiday bookings and see at a glance how many days they have left to take, update their contact details and view company documents. Providing individuals with ESS access dramatically reduces the number of calls to HR or payroll. It is possible to distribute payslips electronically using the People Inc. Employee Self-Service module. This is done by attaching copies of payslips to employee records within the system. Employees can then access their latest payslip together with payslips from previous months (or weeks) via their ESS login. The People Inc. Attach Payslips plug-in takes a batch of payslips, either monthly or weekly (usually in PDF format) and imports them into the People Inc. system. The plug-in automatically processes each payslip, finding the employee it relates to, as well as the year and period for which it is relevant. 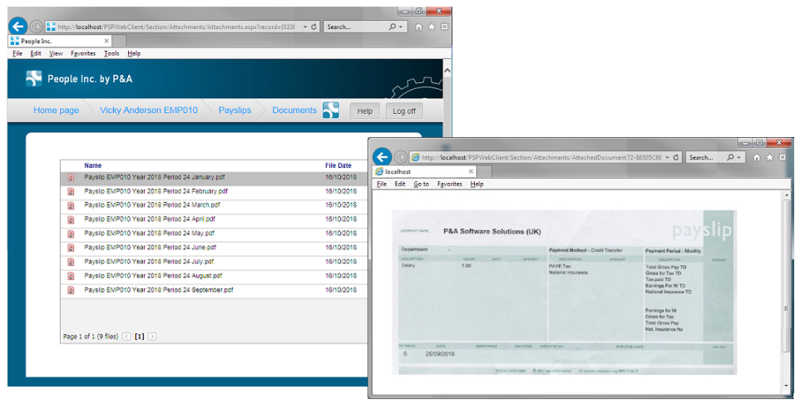 Employees can them view their payslips via a web browser using their ESS login. The plug-in makes it quick and easy to process a monthly batch of payslips. The Employee Self Service can provide a direct cost saving, especially when used in conjunction with this plug-in. With payslips available via the ESS, it is no longer necessary to print or post them to individuals each month. Providing printed pay slips typically costs between £1.35 and £2.25 each. For an organisation with 200 employees, providing paper-pay slips might therefore cost more than £5000 each year. Utilising the ESS enables employees to notify payroll when important information such as their home address or bank account change. In addition add-on tools are available for the People Inc. ESS to enable employees to submit timesheets and file expense claims. By having pay slips available online, instead of a physical copy, this removes the possibility of losing it, the pay slip being handed to the wrong person, it being damaged or lost in the mail etc. It also locks the pay slip behind a username and password, allowing for authentication that this person is allowed to see this record for example. These pay slips are stored in a central location, in the People Inc. Database, attached to employee records, meaning that HR always know where each pay slip is, maintaining good organisation. As the documents are attached to a separate (linked) screen to the employees, if need be, admin can block access to the child screen on a user by user level. This keeps access secure and limited to only those who need it. ESS users are automatically filtered such that only their records attached document is shown. How to get the Attach Payslip Plug-in. This plug-in is not available as an open download on our resources page like many other wizards and plug-ins. Instead, the user would need to contact the People Inc. Help desk (on 01908 265111) as there will need to be some level of consultancy as part of installation due to the way this plugin must cooperate with the payroll software.